Author: Said Babura Ahmad. Series edited by: Herrmann Jungraithmayr, Norbert Cyffer. 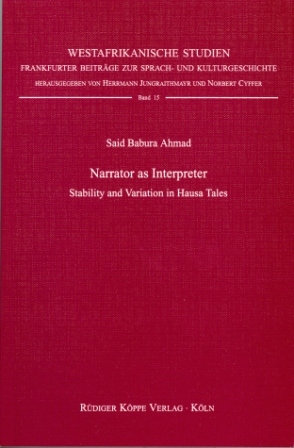 General - Themes - Plot structures - Variability and Stability in Versions of The Tale - Performance and Performer - Review of the Literature on Hausa Tales. The Shared Core of the Stories “A Girl and her Father” and “A Girl and her Elder Brother” - The Shared Core of the Stories “Gizo and the Birds” and “Gizo and the Cranes” - The Shared Core of the Stories “The Poor Man Picked up by a Dove” and “The Man who had a Gown of Fronds of Dum-Palm” - Variation in the Presentation of the World of the Tale Aspects of Narrative Technique in the Performances of Hajiya Saude, Kubura Magaji and Hececi: Hajiya Saude’s Performance - Kubura Magaji’s Performance - Abdu Gala’s Performance. Undoubtedly, the book is an important step in the research efforts on Hausa oral literature. Although its essential part counts only 103 pages, it discusses a gamut of problems connected with tatsuniya. Its appendices are not only samples of source materials but can also serve as an anthology of Hausa tales and be used in teaching.